If your husband is like The Cowboy he has a baseball hat collection that numbers well into the hundreds (that might be a slight exaggeration). Add two little boys who are starting their own baseball hat collection and you can imagine what my house looks like. There isn’t a flat surface that doesn’t have a hat, or three, resting on it. 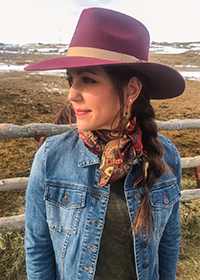 I do admit to having a small scarf collecting issue of my own…but they really are necessary in Wyoming!One day, I got sick and tired of digging through a basket to try and find the scarf I needed yet again. As if this wasn’t stressful enough, Cowboy W (2 years old at the time) tugged on my shirt, crying hysterically for his lion hat. I knew something had to change! Since we were headed out anyway, I made a mental note to browse the home aisle at the store to come up with a solution. Less than $30 later I was all set to go home and put together my new area for hats and scarves. Take a look at the picture first, and then follow along as I explain what I used and how I did it. 1. 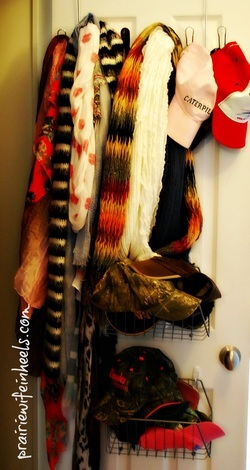 Place your hanging hooks over the top of the door and place your scarves on them. 2. Hold the first basket up to the door and mark where you need your hooks to be with a pencil. Make sure your scarves are not pooling up in the basket, it needs to be somewhat near the middle of the door. 3. Following the directions in the package place your damage free hooks on the marked spots. 4. Repeat steps 2 and 3 for your second basket. 5. Put your hats in the basket. I used the lower basket for the kids’ hats so that they could reach them without my help. 6. Close the door and pat yourself on the back for getting the job done. 7. 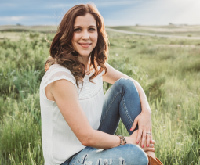 Spend two weeks training the Cowboys (big and little) to put their hats away…and look for them in the basket before they ask you where they are.